Discover The Importance of Creating a Self-Care Routine, especially if you have an autoimmune or inflammatory condition, and how you can get started creating your own routine today. Self-care is being recognized as an integral part of a happy and healthy lifestyle, especially if you are living with an autoimmune or inflammatory condition. 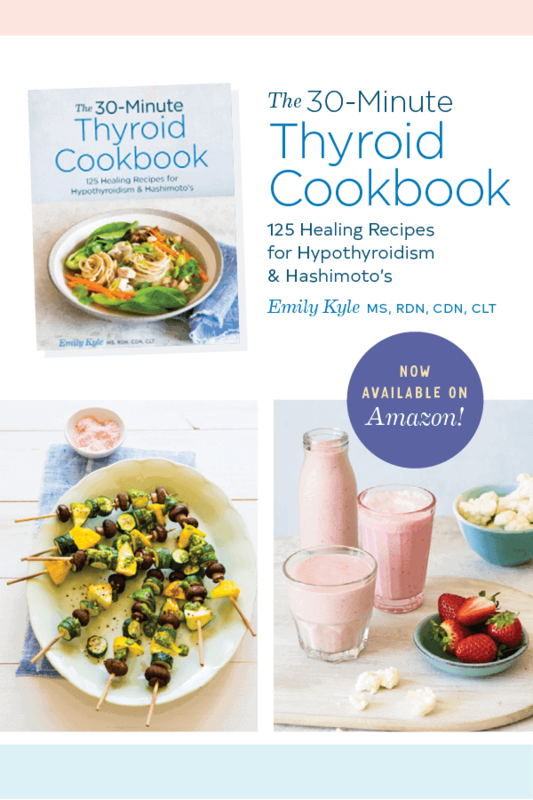 I even wrote about the importance of self-care in my new cookbook, The 30-Minute Thyroid Cookbook. But what exactly is self-care and why is self-care especially important for those living with autoimmune or inflammatory conditions? Self-care refers to activities and practices that we engage in on a regular basis to reduce stress and to maintain and enhance our short-term and long-term health and well-being. As a holistic dietitian, I believe that good health is a result of a healthy mind, body, and soul, and that self-care serves as the balance between these three forces. For anyone living with an autoimmune condition, it is especially important to take care of all of these forces in harmony for optimal health and healing. Self-care is not optional, but essential, to developing and maintaining a happy & healthy lifestyle. The only thing we are guaranteed is the present moment, and self-care is about restoration so that you can be your best self today, and tomorrow. It is hard to identify the need for self-care if you have never practiced it before. I never recognized the importance of self-care until I became a mother. I was a young mom and I was completely unprepared for the changes that motherhood brought to me and my lifestyle. I have always been an introvert, fiercely independent, and at times, selfish with my wants and needs. Those qualities are not the most helpful when you have a new baby to care for. I was blessed to stay at home with my son until he was six months old, but in all honesty, those six months were also some of the most difficult months of my life. Having to share myself, my space, my body and my time was a test of my patience and my willpower. Those six months were hard, but they were also an incredible learning experience for me. My time alone(ish) allowed me to have time to reflect on and to develop the relationship I have with myself. I now understand that the relationships that we have with ourselves are the most important relationships we will ever have in our lifetime. We need to feel comfortable putting more time, energy, and care into that relationship, the relationship with ourselves. I believe that self-care is an extension of the relationship we have with ourselves, a way for us to nurture and develop ourselves in a kind, patient, and compassionate manner; just like we care for our children, spouses, and family members. Somewhere along the lines of growing up and becoming an adult, I think we may have missed the message that the relationship we have with ourselves is the most important one we will ever have. A strong and solid self-loving relationship is key to an abundant, productive and joyful life. But no one ever teaches us how to cultivate that relationship, that is for each of us to discover on our own. That is why I am so passionate about empowering and encouraging you to feel comfortable practicing self-care in whatever way feels best to you. The most important concept to remember is that self-care is highly unique to each person. My self-care routine is not going to work for you because we have different wants and needs, we feel fulfilled and whole in different ways. This is where your job comes in, to find what keeps YOU your happiest & healthiest. My job is to provide you with the tips and tricks and ideas that may spark your interest and cause you to think differently and expand your ideas about self-love. But only you can apply these ideas in a way that works best for you and your lifestyle. The most important thing to keep in mind when creating your own self-care routine is that it will only serve you if you can identify when you need it the most. Being able to do this means that you need to be invested in developing the relationship you have with yourself. Creating a self-care routine is critical to maintaining your own health and happiness so that you can create a life filled with joy and wonder. However, I think it is important to note that self-care is the culmination of the little things we do for ourselves every moment of every day, not some radical change that you make quickly and without thought. As you move forward in learning how to create your own self-care routine, please keep this in mind, as this happy & healthy lifestyle you are developing is very much a journey, not reaching a destination. As I have mentioned before, I believe that good health is the result of a healthy mind, body, soul and that self-care serves as the balance between these three forces. That is why I believe it is critical to create a self-care routine that focuses on restoring yourself mentally, physically and emotionally. Combining mental, physical and emotional self-care practices will allow you to develop a well-rounded, nurtured lifestyle that will keep you both happy & healthy. It is important to keep in mind though, that when I say routine, I don’t mean that you have to do the same thing over and over again each day. When I refer to the word routine, I just want you to have some ideas, tips and tricks in the back of your mind that you can draw from when you need it the most. Just like every day brings us a set of new challenges and obstacles to overcome, every day we need new and unique ways to practice self-care. As you continue to develop the relationship that you have with yourself, you will begin to discover what self-care practices help you the most. You will also learn that self-care does not always need to come in big elaborate gestures, it is often the smallest things that bring us the most peace and joy. For me, self-care ranges anywhere from an act as small as enjoying my favorite cup of tea alone in the quiet morning to an act as large as planning an entire spa getaway at my favorite resort. Both are entirely different, and appropriate at different times, but both bring me inner peace and joy at different levels. For anyone who has never practiced self-care before, it may be a little daunting to get started. The key is to getting comfortable trying something new, having an open mind, and then making the decision as to whether or not it was helpful to your overall well-being in the long run. To help you get started, I have created this super awesome Freebie of the Week. You can now download the checklist: 99 Ways to Practice Mental, Physical & Emotional Self-Care! Yes, we are just so busy! Enjoy the checklist, thanks Julie! I hope getting your workout in feels like a good use of self-care though! Sometimes its all we can do, the little things! I hope you enjoy, thanks Taylor! Thank you, Lorie, I too think it is important for us to be reminded of self-care a bit more often! Yes, I don’t think people realize there are so many different aspects of health! Thank you so much, Deryn! So so important! Wow, this is amazing. So many great tips…can’t wait to check out all the ideas. It is so important, isnt it…i think a lot of people are unsure how to practice It, this is great. Thanks! This is such a great idea for a post! For me self-care is all about movement. I work at home, a lot of time sitting or in the kitchen, so walks and bonding time with my husband make me feel re-energized. If we can’t get outside, I set aside fitness time every single day! Most people like long baths or other mellow things, but I sit enough! SO true! Self care is so important, and for so many different aspects of health! This is a topic I feel like I need to be reminded of often. I start a self care routine and then let things get in the way. Ilittke reminders like this bring me back to it! Yes, yes, yes!! Love this post! Such a great reminder for me! Thanks for the checklist! Thank you so much, Katherine, I hope everyone finds it super helpful! So important but I also find it so hard at times to make time for myself with the family even though I know it’s best. I do make sure I get my workouts in as a priority but beyond that it’s whatever I can fit in and sometimes it isn’t much, especially lately I always feel like I’m struggling to catch up with my days. In our busy lives self-care is often the first thing to go. I love this checklist and reminder to actually make it happen. Great post Emily ! What a great post! “Self-care is not optional but essential to a happy & healthy lifestyle” Absolutely! I couldn’t have said it better myself. I’ve never been a mother but this struck a chord with me – “I have always been an introvert, fiercely independent, and at times selfish with my wants and needs.” I definitely can relate to that! I have a feeling I should practice lots of self care so I can prepare myself for the future when babies come along 🙂 Great post, Emily!